A Couple of Rough Days….. If you are reading this blog post…….you are supporting me and my family. And before I say anything else tonight…….I just want to say “THANK YOU” for that! We have been absolutely overwhelmed this last week with love, prayers, and encouragement for our family and for Cannon. Whether it be comments via social media or this blog. Visitors to the hospital. Phone calls, texts, emails and such. Gifts brought to the hospital. I mean, seriously! You guys know how to make us feel loved! And we could not be more grateful! From the bottom of our hearts……THANK YOU! The last couple of days have been R-O-U-G-H. We have a system that is pretty worked out when it comes to these hospitalizations but there is no way to make it easy. The sheer volume of output and diapers have been tremendous. The wait times for tests and results…..LONGer than usual. And the sensory and physical pain we have had to witness Cannon go through is just plain heartbreaking. He has, as always, amazed us even still with his strength, courage, and capacity for love. This child blows my mind constantly! He thanks me for every diaper change and even just for pulling up his blanket. Every time. I mean, how sweet can you get??!! I LOVE THIS BOY! Ok Kimberly…….focus! Sorry, I am wiped so I am going to shoot for the abbreviated version. For once. 🙂 Our week so far has looked something like this. Monday……..brought to E.R., determined to be impacted, admitted to hospital, plan of action devised. Tuesday……waited most of day for anesthesia to put in N.G. tube and I.V., first gallon of “Go Lytely” (medicine) begun. Wednesday……1st gallon completed, 1st x-rays taken, 2nd gallon begun while waiting, 1st x-rays show movement but still impacted. Thursday……2nd gallon completed, 2nd x-ray taken, 3rd gallon begun, 2nd x-ray shows still not clear. And where we are at this exact moment is that we are finishing the 3rd gallon and will start a 4th that will run through the night. He is still not clear. We are getting there but we aren’t there yet. In the morning, we will x-ray again and hopefully see a squeaky clean colon. And be allowed to go home. With only one more battle to fight. The horrible cramping that comes the day after this particular medicine. I admit it. I shed a few tears in the privacy of the Parent Lounge tonight while I inhaled a fast dinner. We had been given so much hope since we got here that “this time…..it wasn’t so bad.” And I fell for it. Even though I knew his body better than that. To the average doctor…..his initial x-ray wasn’t as bad as previous admissions. So that should mean it would clean out faster. But his body just takes its sweet time to get rid of what it needs to get rid of. And even though we are close, the thought of starting a 4th gallon……just broke my heart. Cannon is so ready for this to be over. He wants this tube out of his nose and the I.V. out of his hand. He wants to go play in the playroom. And to eat and drink what he wants again. He begged and cried so hard for milk today. But he can only have clear liquids while this is going on. He is refusing to drink so that leaves jello. And there is only one kind that we can find in this city that does not have artificial colors (a restriction of his diet). And the flavor is peach mango. A strong one that he doesn’t particularly care for. He eats about 1 small cup a day. He has also decided since we got here that he will not take his meds. He is normally a fantastic medicine taker. And thank God for that since he takes 13 meds a day! But not right now. So, we are putting what we can through his N.G. tube and trying to hide the others in jello. He just has no control over anything right now and this medicine thing is THE one that he can try to put his foot down on. Anyways, tonight, when I let a tear or two or three spill out……I just had to sit there and tell myself over and over that God is in control. Even if my heart wasn’t totally cooperating with my mind……I needed to say it. A “fake it till you make it” of sorts. Because I do know that this is so . Even in the weak moments. I came back in to Cannon and prayed with him as well. I prayed desperately for God to take his pain away, to heal his body completely, and to allow Cannon to feel HIS love and strength all his life, not just tonight. I long for my children to develop the habit of praying when they need encouragement and/or feel weak. And to know that the only true fulfillment in life is the kind you feel when you love and trust God. Even when things are hard or don’t make sense. I took Townsend down to the cafeteria for a quick lunch today. After we got our food and walked into the dining area, I discovered there was not one free table in the place. A woman called to me that I was welcome to sit with her. So, we graciously accepted her invitation! Upon talking to this woman, I gained some real perspective. She was there while her husband was having his second major surgery in a month. (The first was open heart surgery.) He had found out this morning he has kidney cancer and would need to have a kidney removed today. And that they would not know until they got in there if the cancer had spread. My heart went out to her and I offered to pray with her. I ask you now to do the same for this stranger I will probably never see again. His wife’s name was Virginia and his name is Ollie. 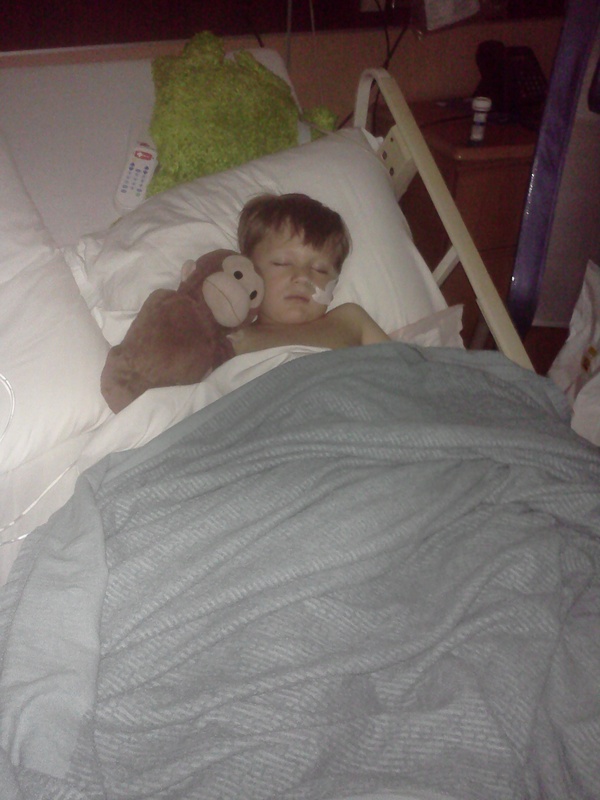 My child will most likely be well again in the next day or two and his issue should not ever be life threatening. Every time I hear a story like this or the whir of the hospital’s helicopter landing on the roof…..I gain perspective. It could always be worse. It is my hope that you will now listen to and meditate on this precious song. One of my current faves. I am posting the lyric video version so you can truly focus on the words. I pray that God reminds you through it that he is always near. He is real. And worthy of our trust and love. Especially when life is hard! Love ya’ll! Thank you again for all the support!